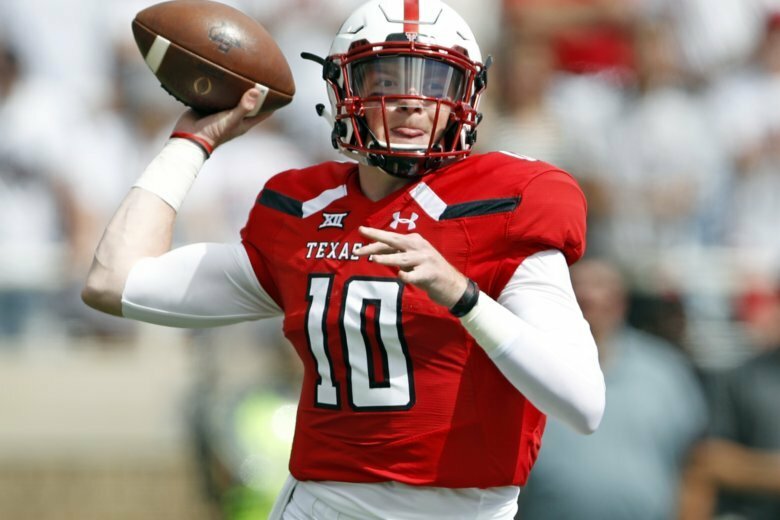 Alan Bowman looks to be next in line on the list of prolific passers who have come through Texas Tech. The true freshman sits No. 2 on the national passing chart this week after throwing for 605 yards and five touchdowns in the Red Raiders’ 63-49 win over Houston on Saturday. Bowman’s total was the highest nationally since former Tech and current Kansas City Chiefs QB Patrick Mahomes threw for 734 yards against Oklahoma in 2016. Bowman broke the Big 12 freshman record of 598 yards set by Mahomes against Baylor in 2014, and his five TDs were most by a Tech quarterback since Nic Shimonek’s six against Arizona State last season. Bowman completed 43 of 59 passes, with 13 of them to Antoine Wesley, who set a school record with 261 receiving yards. A three-star recruit from Grapevine, Texas, Bowman is proving to be a perfect fit in the “Air Raid” offense that Kliff Kingsbury learned when he played for Mike Leach at Tech. Bowman lost the preseason competition to McLane Carter, but hasn’t come out since Carter was injured in the first quarter of the opener. He averages 386.7 yards per game to rank second to Gardner Minshew, who’s passing for 401 yards per game for Leach at Washington State. Bowman has completed 70.7 percent of his passes (94 of 133) and has eight touchdowns against no interceptions. Darrell Henderson of Memphis turned in the top rushing performance of the week, going for 233 yards on 14 carries against Georgia State. That outing came after he ran for 212 yards on 13 carries the previous week. The only other 200-yard game over the weekend belonged to Navy’s Malcolm Perry, who had 223 yards on 19 runs against Lehigh. Freshman receiver Daniel George couldn’t have envisioned starting his Penn State career the way he did. In his first appearance, he caught a 95-yard touchdown from backup quarterback Sean Clifford in the fourth quarter against Kent State. It was the longest play from scrimmage in program history by 3 yards. TCU’s Darius Anderson broke the nation’s longest run when he went 93 yards for a touchdown against Ohio State. Not only was it the longest rushing play in Horned Frogs’ history, it was the longest play from scrimmage ever allowed by the Buckeyes. Washington State’s Travell Harris became the fourth player this season to return a kickoff 100 yards when he did it against Eastern Washington. Others who have done it are Utah State’s Savon Scarver, Appalachian State’s Darrynton Evans and Ohio’s DL Knock. Fourteen players had 100-yard returns last season. Davidson set a Football Championship Subdivision record with 964 total yards in a 91-61 win over Guilford on Thursday. A caveat: Guilford is a Division III team that was playing two levels up.